What I think: This is one of their larger ballistics so could be cut in half but it is a chore. I find them to be a bit over powering sometimes and this is one of then, it would be better if it was the mini size especially as Lush says it’s a great hangover cure. I think I’d be feeling worse if I had one! Anyway I thought it appropriate to use this New Year’s day as it’s an after-party ballistic. I was tee-totalling it last night as I’m on antibiotics so I can’t comment on it curing your hangover. 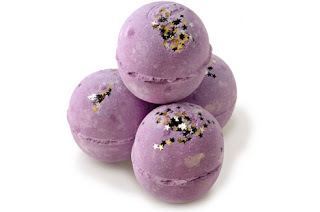 But my guess would be no :P It turns your bath a vivid purple with little gold, silver and purple stars floating around and smells like my fruit teas! Re-buy? Once a year is fine, it’s a bit over powering to use regularly.